…a beloved combination that offers precious breaths of AIR!! FOS CREATIONS There are 21 products. 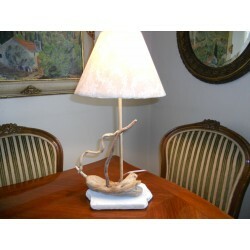 Table lamp, decorated with a sailing boat made of sea driftwood on a wave. 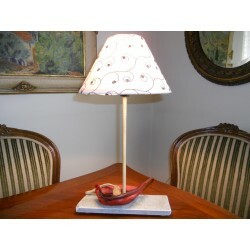 In this creation the base is from marble and it is decorated with a copper tube configured by hand as a sail outline. 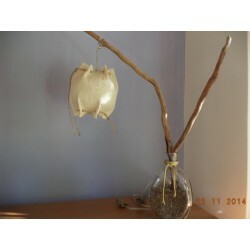 A handmade bell-shade completes this artwork, made of burlap fabric in off-white colour, decorated with copper wire. 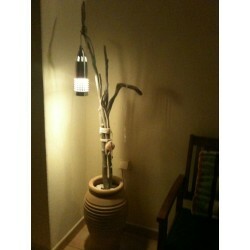 Floor lamp / Base: large ceramic pot filled with pebbles and sand / Shade: plastic in metal colour, hanging in a complex of sea driftwood. 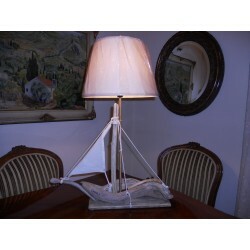 Table lamp, decorated with a boat made of sea driftwood, base from marble and shade (medium) covered in off-white/beige organza with a discreet design. 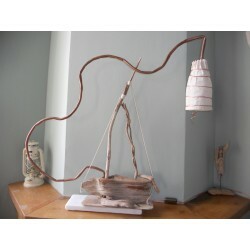 Table lamp, decorated with a sailing boat made from sea driftwood, base made of plank and shade (large) in off-white. The sails are made of canvas. 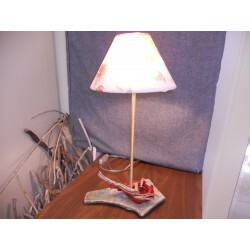 Table lamp, decorated with a small red boat from sea driftwood, base from Karystian slate and a (small) shade covered in an off-white/black lace (muslin) with a discreet design. Alternativelly, the shade can be red, covered by red sack cloth, with black string. 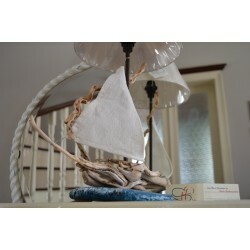 Table lamp, decorated with a sailing boat made from sea driftwood, base made of hand-painted wood and shade (medium) in off-white. Table lamp, decorated with a wood-carved boat on a wave, made of sea driftwood, hand-painted, with a shade (large) in off-white. 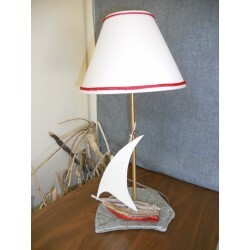 Table lamp, decorated with a small red boat from sea driftwood, base from Karystian slate and a (small) shade covered in an off-white/red fine silk fabric (muslin) with a discreet design. 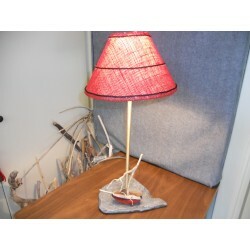 Table lamp, decorated with a small red boat from sea driftwood, base from Karystian slate and a (small) shade covered by red sack cloth, with black string. Alternativelly, the shade can be off-white, decorated with blue-jeans patches. 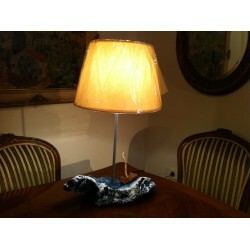 Table lamp, decorated with a sailing boat made of sea driftwood, with a sail made from canvas. Base from Karystian slate and an off-white (medium) shade with red string. 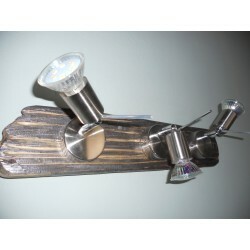 Wall lamp, with 3 spots (GU10) in a metallic colour, with a base from antiquated sea plank. The processing of the plank was done in hand, with sand paper and wood carving, while a further combination of acrylic colours was used give the antiquated effect. Table lamp with a bottle base filled with small multi-coloured sea pebbles. Support axis from sea driftwood. Hand-made shade made from an off-white sack cloth.